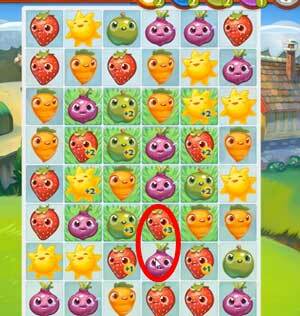 These Farm Heroes level 41 cheats and tips will help you beat level 41 of Farm Heroes. 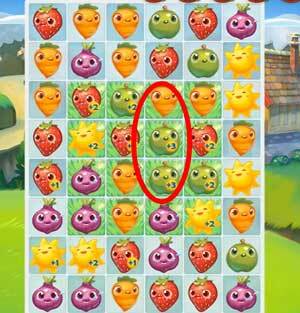 The objective of Farm Heroes level 41 is to collect 40 suns, 30 apples, and 30 strawberries in 11 moves. 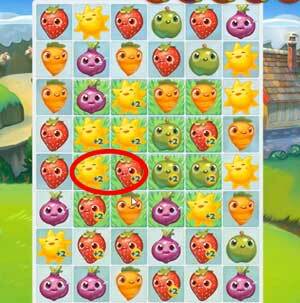 The goal of Farm Heroes Saga level 41 is to collect 40 sun, 30 apples, and 30 strawberries in just 11 moves. Since you have so few movies and few obstacles to deal with, spend all of your time trying to collect suns, apples, and strawberries. Try to clear them next to other cropsies so you can increase their value. While you can collect cropsies wherever they are, you’ll get bonus cropsies from the grass. Start by clearing any of the three cropsies you need on the grassy area first, and let new ones fall down onto the grass. If you can’t do anything on the grass, work below it to get more cropsies to fall, or collect cropsies you need elsewhere. Collect cropsies you need is your priority, but sometimes collecting another type of crop can be more beneficial if they adjacent to lots of the cropsies you need. If you can make a big match near your needed cropsies, they’ll be worth more, and you’ll be able to collect your resources faster.